These warm, baked Reuben Pinwheels are a delicious twist on a Corned Beef Reuben Sandwich. Perfect, hearty appetizers for a party! Looking for fun snack food for St. Patrick’s Day or a March Madness watch party? 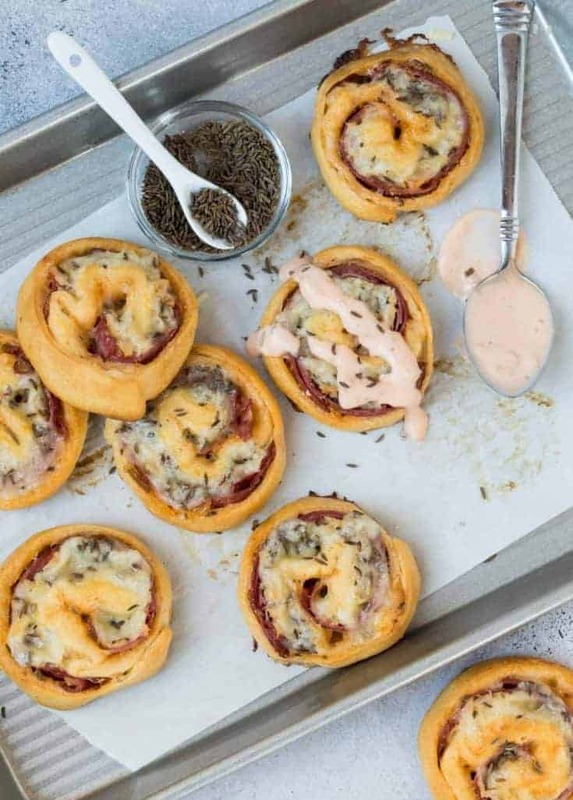 This Reuben Pinwheels recipe yields bite-sized versions of the popular Reuben Sandwich. With only six ingredients, these babies come together in minutes – perfect for easy entertaining! It’s fair to say that I don’t eat a lot of Reuben sandwiches any other time of year besides March. But there is something about these addicting Reuben Pinwheels that has me thinking I’ll be enjoying corned beef a lot more often. Although we long associate corned beef and cabbage as traditional Irish fare, the Reuben Sandwich is actually an American invention. This grilled sandwich is made with corned beef, sauerkraut, Swiss cheese, rye bread and Thousand Island dressing. These easy Reuben Pinwheels are spot on in flavor to a grilled Reuben but take a few liberties with the ingredients, including swapping in crescent roll dough for the rye bread. We didn’t forget the recipe’s fabled tie to Ireland, though, and rely on Kerrygold® Swiss Cheese for its rich, grass-fed flavor in these snacks. 1. Roll your dough tightly. If you don’t, your pinwheels won’t stay together when baking. 2. Don’t overstuff your dough. It’s tempting to pile on all the filling ingredients (more is usually better, right?). But in this case, follow the recipe and keep the ingredients away from the edges of the dough so it will seal properly. 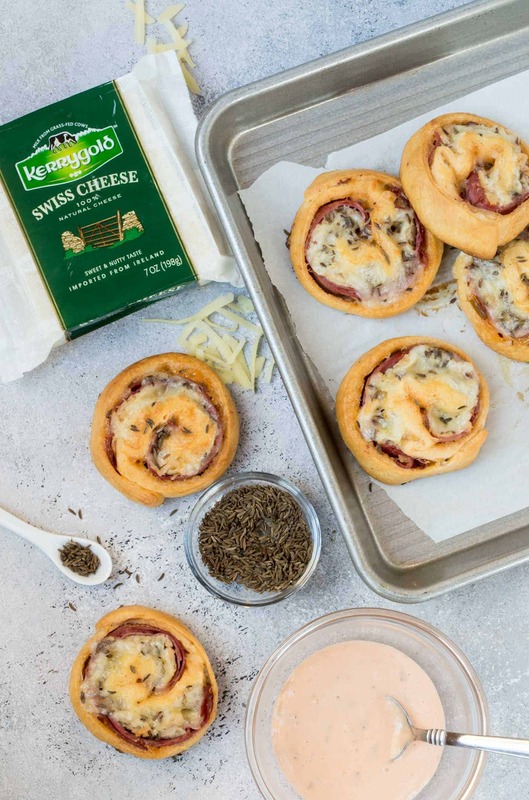 We love to dip our Reuben Pinwheels in a bit of extra Thousand Island dressing, but go ahead and drizzle some of the dressing on top of the pinwheels if you’re feeling extra fancy. Or just eat them sans dressing. You really can’t go wrong with these tasty bites. Can I make these Reuben Pinwheels ahead of time? Absolutely! Prep these pinwheels a few hours before guests arrive. Simply complete the recipe through step 3, cover tightly and refrigerate. Pop them in the oven to bake right before the party starts. Preheat oven to 375 degrees. Line a baking sheet with parchment paper. Set aside. Unroll crescent roll dough and smooth into a mostly uniform rectangle. Evenly spread dressing over the dough leaving 1/2 inch of dough edges uncovered (like a frame). Evenly divide corned beef, sauerkraut, Swiss cheese and caraway seeds over the dressing on the dough. Starting at the short end, tightly roll the dough into a cylinder like a jelly roll. Evenly cut the dough into 16 pieces and place on the baking sheet. Bake for 14 minutes or until golden brown. Allow to cool for at least 5 minutes before removing from pan. Serve with additional Thousand Island dressing.